Citation Information: J Clin Invest. 2005;115(8):2064-2067. https://doi.org/10.1172/JCI26041. Reports of neoplasia related to insertional activation of protooncogenes by retroviral vectors have raised serious safety concerns in the field of gene therapy. Modification of current approaches is urgently required to minimize the deleterious consequences of insertional mutagenesis. In this issue of the JCI, Adjali and colleagues report on their treatment of SCID mice lacking the 70-kDa protein tyrosine kinase, ZAP-70, with direct intrathymic injection of a ZAP-70–expressing T cell–specific lentiviral vector, which resulted in T cell reconstitution. Using lentiviral vectors and in situ gene transfer may represent a safer approach than using retroviral vectors for ex vivo gene transfer into HSCs, avoiding 3 factors potentially linked to leukemogenesis, namely HSC targets, ex vivo transduction and expansion, and standard Moloney leukemia virus–based retroviral vectors. Gene therapy approaches for SCID. (A) Previously (4, 5), after informed parental consent, bone marrow was obtained from young boys with SCID-X1 who did not have an HLA-identical donor. Selection for the CD34+ cell population was performed, and these cells were stimulated to grow in media containing 4% fetal calf serum and supplemented with SCF, IL-3, Flt-3 ligand (FLT-3L), and megakaryocyte growth and differentiation factor (MGDF). The cells were transduced with a Moloney leukemia virus_based (MLV-based) replication-incompetent vector containing the common γ chain (γc) for 3 days. The cells were reinfused into the patients without a preparative conditioning regimen. In the majority of the boys, mature and functional T cells were reconstituted. Unfortunately, 3 of 11 boys enrolled in this clinical trial developed a T cell leukemia related to the oncoretroviral vector used (6). 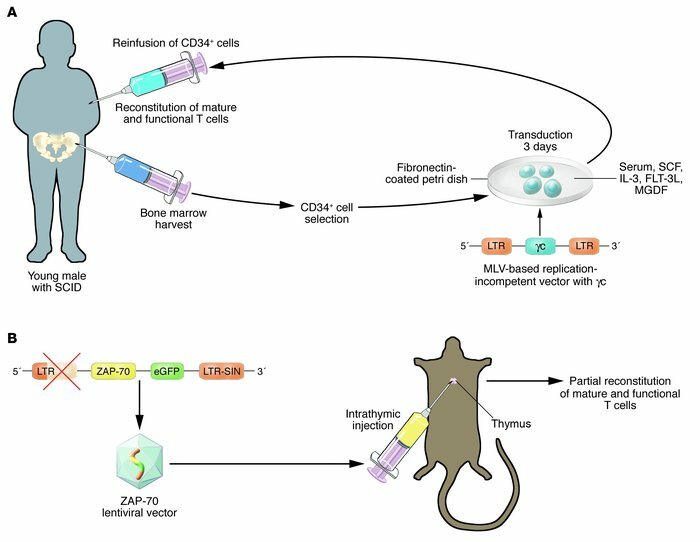 (B) In this issue of the JCI, Adjali and colleagues report (10) that they injected a T cell_specific lentiviral vector encoding human ZAP-70 and enhanced GFP (eGFP) directly into the thymi of 8- to 12-week old ZAP-70–/– mice after thoracic surgery. Some of the mice partially reconstituted mature and functional T cells. LTR, long terminal repeat; LTR-SIN, self-inactivating LTR.